South Korea and the United States struck a new deal Sunday that increases Seoul's contribution for the cost of the American military presence on its soil, overcoming previous failed negotiations that caused worries about their decades-long alliance. The development comes as President Donald Trump is set to hold his second summit with North Korean leader Kim Jong Un in Vietnam in late February. South Korea last year provided about $830 million, covering roughly 40 percent of the cost of the deployment of 28,500 U.S. soldiers whose presence is meant to deter aggression from North Korea. Trump has pushed for South Korea to pay more. The statement said the two countries reaffirmed the need for a "stable" U.S. military deployment amid the "rapidly changing situation on the Korean Peninsula." The ministry said the U.S. assured South Korea that it is committed to the alliance and has no plans to adjust the number of its troops in South Korea. South Korea began paying for the U.S. military deployment in the early 1990s, after rebuilding its economy from the devastation of the 1950-1953 Korean War. The big U.S. military presence in South Korea is a symbol of the countries' alliance, forged in blood during the war, but also a source of long-running anti-American sentiments. About 20 anti-U.S. activists rallied near the Foreign Ministry building in Seoul on Sunday, chanting slogans like "No more money for U.S. troops." No violence was reported. "The United States government realizes that Korea does a lot for our alliance and peace and stability in the region," chief U.S. negotiator Timothy Betts said Sunday in Seoul. "We are very pleased our consultations resulted in agreement that will strengthen transparency and deepen our cooperation and the alliance." 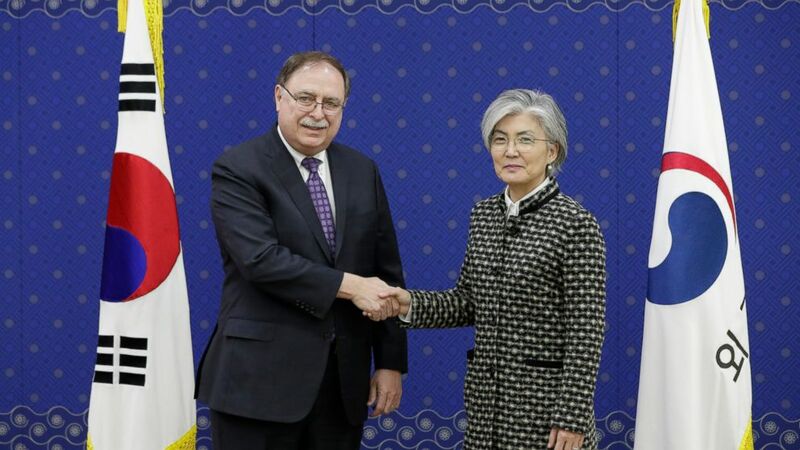 The deal, which involves the spending of South Korean taxpayer money, requires parliamentary approval in South Korea, but not in the United States, according to Seoul's Foreign Ministry. The allies had failed to reach a new cost-sharing plan during some 10 rounds of talks. A five-year 2014 deal that covered South Korea's payment last year expired at the end of 2018. Some conservatives in South Korea voiced concerns over a weakening alliance with the United States at the same time as negotiations with North Korea to deprive it of its nuclear weapons hit a stalemate. They said Trump might use the failed military cost-sharing negotiations as an excuse to pull back some U.S. troops in South Korea as a bargaining chip in talks with North Korean leader Kim Jong Un. Trump told CBS' "Face the Nation" on Feb. 3 that he has no plans to withdraw troops from South Korea. During his election campaign, Trump suggested he could pull back troops from South Korea and Japan unless they took on greater a share of the financial burdens of supporting U.S. soldiers deployed there. South Korean media earlier reported that Trump demanded South Korea double its spending for the U.S. military deployment, before his government eventually asked for 1.13 trillion won ($1 billion). Seoul's Foreign Ministry said the U.S. had called for a sharp increase in South Korean spending but didn't elaborate. Trump announced last week that he will sit down with Kim for their second summit. Their first summit in Singapore last June resulted in Kim's vague commitment to the "complete denuclearization of the Korean Peninsula," a term that his propaganda machine previously used when it argued it would only denuclearize after the U.S. withdraws its troops from South Korea. Trump's top envoy for North Korea, Stephen Biegun, visited Pyongyang last week to work out details of the upcoming summit. After being briefed by Biegun about his Pyongyang trip, South Korea's presidential office said Sunday that U.S. and North Korean officials plan to meet again the week of Feb. 17 in an unidentified Asian country. The U.S. military arrived in South Korea to disarm Japan, which colonized the Korean Peninsula from 1910-45, following its World War II defeat. Most U.S. troops were withdrawn in 1949 but they returned the next year to fight alongside South Korea in the Korean War. Associated Press journalists Chang Yong Jun and Lee Jin-man contributed to this report.